About 2 weeks ago, Mikyajy (well known regional cosmetics brand) sent across an invite to launch the new face of the brand. My mind immediately went into 'think mode' and I came up with a number of (Arab) celebrities that could be possible contenders. With that in mind, I scrolled to read the remainder of the invitation and that's when I spotted the silhouette of the brand ambassador. And I knew for sure who it was. She is gorgeous, cute and I remember singing to 'Nadini' whenever it came up on Melody TV. 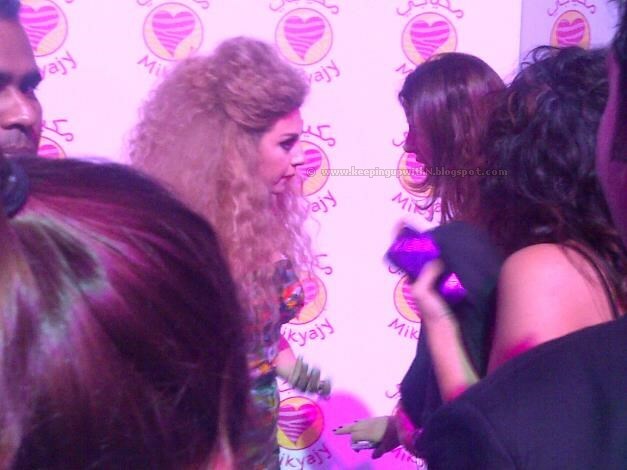 She reminded me of Shakira with that music video. In fact, I sing along to it (the chorus more like it) till date if I hear it- it's French and Latin to me but hey, it's a catchy tune. So D-Day finally arrived for Mikyajy and the launch took place in a setting that looked like backstage. 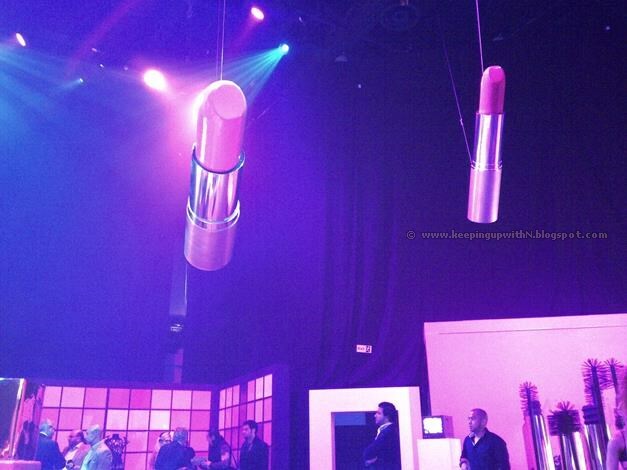 And of course, there were giant lipsticks suspended in the air- adding fun to the setting. 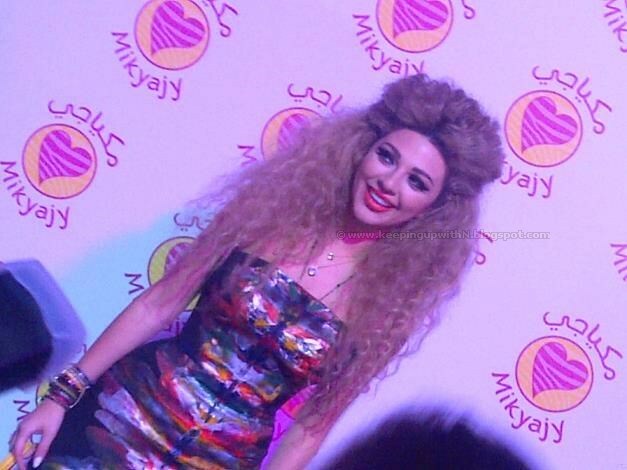 Aaaaand here's the new face of Mikyajy- the gorgeous Myriam Fares. I LOVE her hair! She talked about how she loves makeup and is excited by this collaboration. We also got first look at Mikyajy's ad featuring Myriam. I'm not sure which designer's dress she wore but it looked beautiful- the design was more like watercolors put together against a black canvas. She paired it with sky high Louboutins. She mentioned that her favorite makeup from Mikyajy is Black I. It's a favorite of mine too because I LOVE smokey eyes. Black I is everything black from eye pencils to eye shadows and mascara. Here she is with the founder of Mikyajy, Kamal Osman Jamjoom (left) and the brand's director Jim (right). How beautiful is Myriam? I want her hair! I can't wait to see more makeup looks on Myriam from Mikyajy. Congratulations both! I'm totally happy I got a chance to see the singer up close thanks to the Mikyajy team. She is even more beautiful in person. Pics don't do justice.